It always seems that a busy office is a messy one. But it doesn’t have to be that way. 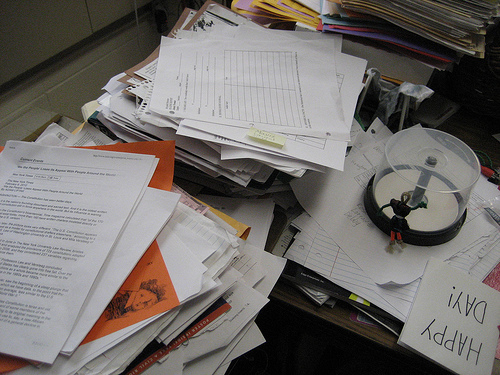 Clutter and chaos can sap you from valuable moments of productivity. Just think of all the time spent looking for an important lost note, or searching aimlessly for something that’s not even on your desk anymore. Yes, having a clean office equates to a productive one, but a clean desktop is a veritable magnet for productivity. It’s inspiring. Your main objectives in having an organized and clutter-free office are 1) to gain control of your information and 2) to arrange your office tools. Having go-to storage locations for your information is a must. Otherwise, you’ll have stacks of paper and folders lingering on your desk because you don’t know where to put them. Don’t get fancy, just label a folder and file it in alphabetical order. Use basic manila folders and any type of hanging file system. The portable ones you buy at office supply stores work great. The key is to label these folders by subject and store them alphabetically. Most small offices or home offices today manage many different job duties (e.g. accounting and marketing) at one desk, and because of space limitations you probably aren’t able to dedicate a file cabinet drawer for each function. Keeping your files organized in a simple, recognizable fashion will save you much time and trouble. Also, make a point to update your filing system each quarter by rotating out all outdated folders to banker’s boxes in a storage location outside your office. Those using loose-leaf planning systems can consolidate your notes into archives with these Day-Timer Storage Slipcases. One of the best ways to keep your desktop clean is by minimizing what’s kept on it in the first place. Your rule of thumb is to keep only the most commonly used tools and office supplies off your desktop, but at an arm’s length away. It may not be critical to have a stapler, tape dispenser, cup of pens, calculator, and paper clip jar all sitting out. Keep them in a drawer within reach. The rest of your tools and resources can be kept in bins on nearby shelves or cabinets. One medium-sized tray should sit atop your desk, serving as the all-encompassing inbox. This is your decision point. Throw all your pending notes, papers, bills and receipts into this tray and each day make a point to empty the inbox by the end of the day. Your next step – and this is important – never put something in your inbox without creating a follow-up task attached to it. For example, if an invoice came in the mail write down a to-do item to pay it before placing it in your inbox. If it can’t be paid today, then file it in the system we described above. Note: Many people argue that filed items get overlooked because they’re out of sight, out of mind, but as long as you have a task item written on your to do list it will never fall through the cracks. Your inbox is the working on-deck circle for all your activities. Make it a vital part of your workstation, and it will never become buried in paper. Do you have a secret to keeping an organized desk? Please share in the comments below.